1 Combine Hellmann's® or Best Foods® Real Mayonnaise, cheese, garlic and Worcestershire sauce in medium bowl. Refrigerate 1/3 cup mixture. 2 Alternately thread chicken, bread and vegetables on skewers. Brush with remaining mayonnaise mixture. 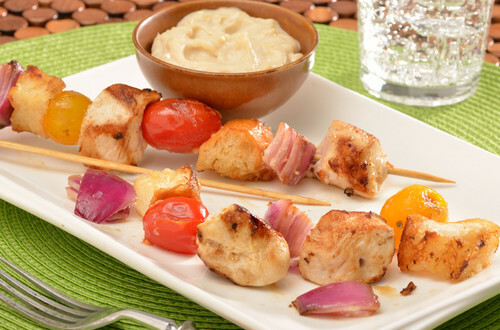 3 Grill or broil kabobs, turning once, 10 minutes or until chicken is thoroughly cooked. Serve with refrigerated mixture.